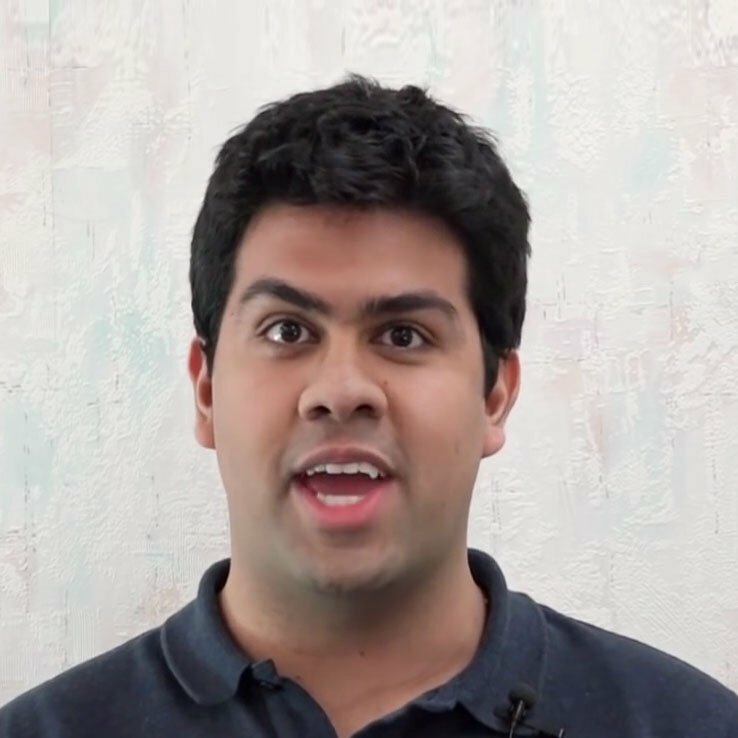 Underbite Correction – Without Surgery or Braces! Most people with an underbite have a large lower jaw and a small upper jaw. 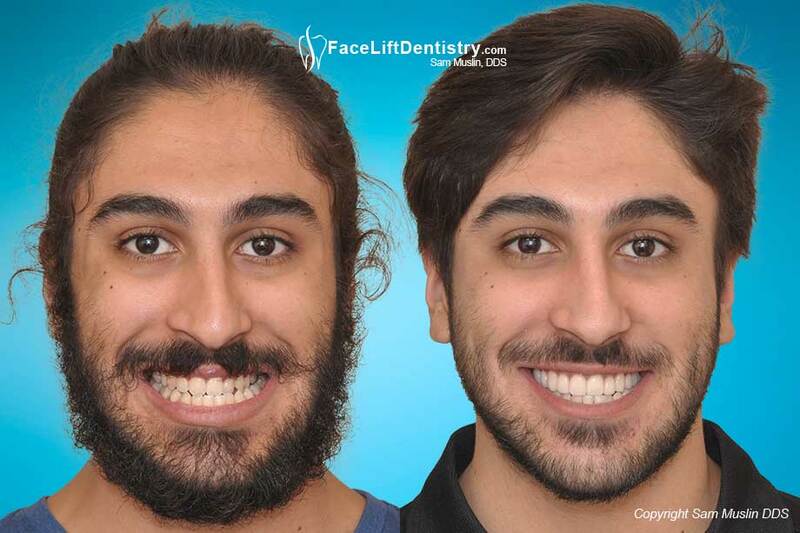 When they ask their orthodontist, general dentist, or oral surgeon what treatment they recommend they usually get the same answer - orthognathic surgery and braces. What this means is that you will be facing hospitalized to have one or both of your jaws cut, the wiring shut of your jaw during the healing period and then several months but most likely years in braces. This patient is biting her teeth together in both pictures. 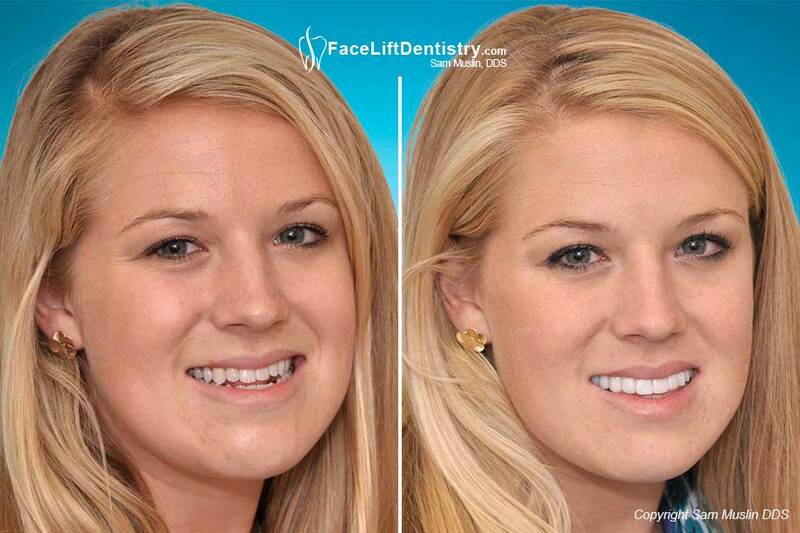 You can see in the before picture on the left that her front teeth do not even touch. This makes chewing and talking normally impossible. The future of dentistry is available today using technology to save your teeth and correct an under bite. The complications and risks of the surgery alone are quite extensive but the seemingly endless amount of time in braces can be exhausting. Fortunately the latest advances in dental medicine have brought us a much safer and non-surgical answer to underbite correction with the creation of VENLAY® restorations. Porcelain Veneers do not Correct Under Bites! There are cosmetic dentists out there that are claiming they can correct an under bite with porcelain veneers. This is simply not true! Porcelain veneers are nothing more than a form of cosmetic camouflage that will only visually hide an underbite. Your actual bite position and jaw position is not corrected. So what does this mean for you? Porcelain veneers do not address the actual under bite problem, which is your bite position. As such your profile and protruding lower jaw are the same with porcelain veneers. This means that you will not get the facial results that you are seeing on this page if your choose porcelain veneers. 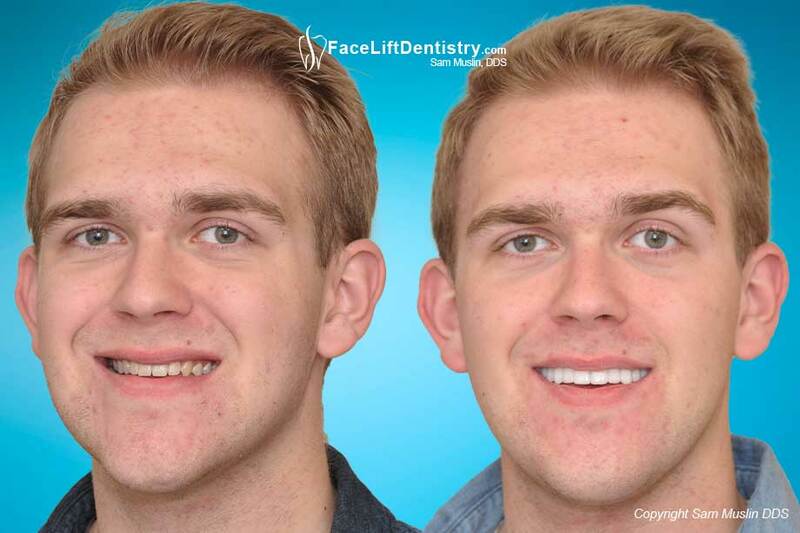 The way that this patient and so many others have gotten the facial improvements that you are seeing is by choosing a non-surgical method to correct their underbite problem. 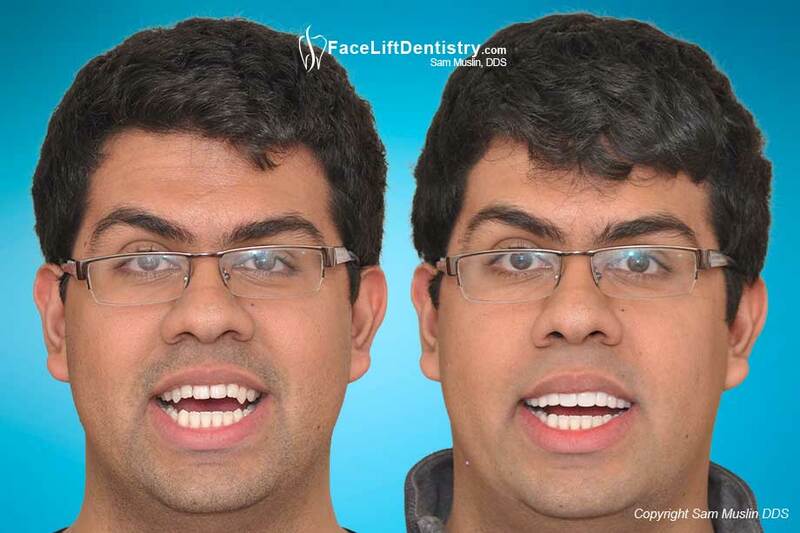 Only the Face Lift Dentistry ® method will actually idealize your bite and jaw position to improve not just your smile but your facial proportions as well. 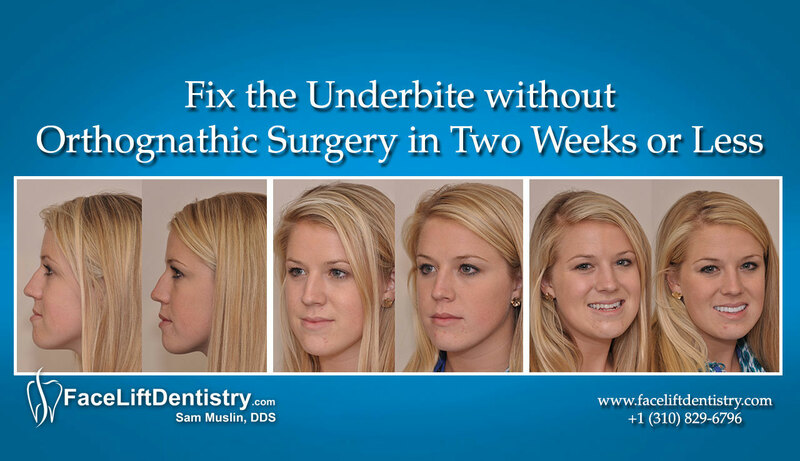 Looking at the images below you will notice that in the left ‘before’ shot her underbite position causes her chin and jaw to protrude. Her upper lip looks small and unsupported and she struggles to chew and speak normally. In her ‘after’ image on the right her treatment is now complete. 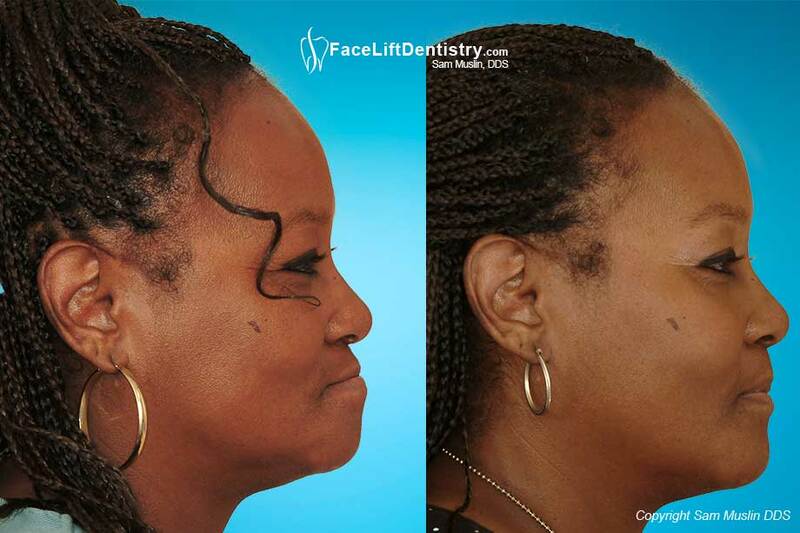 Her jaw is in a healthier position and this corrected the protruding chin problem. 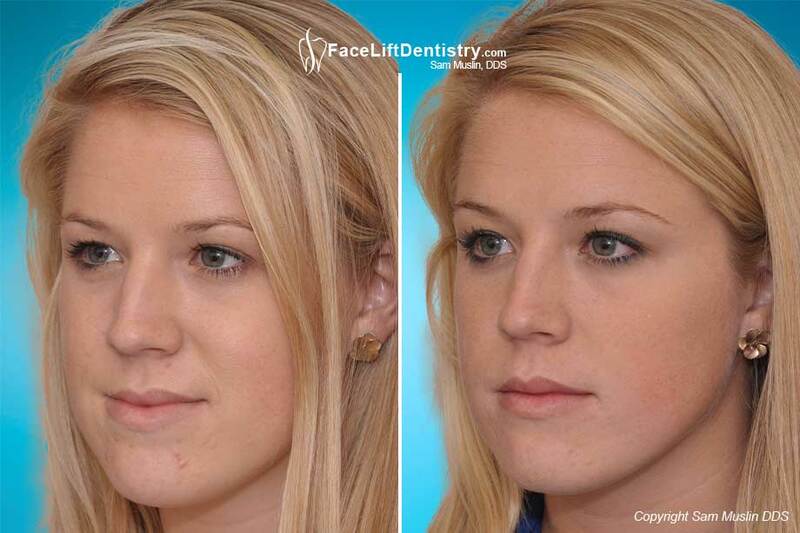 Her upper lip is supported for a fuller appearance and her profile proportions are balanced and feminine. 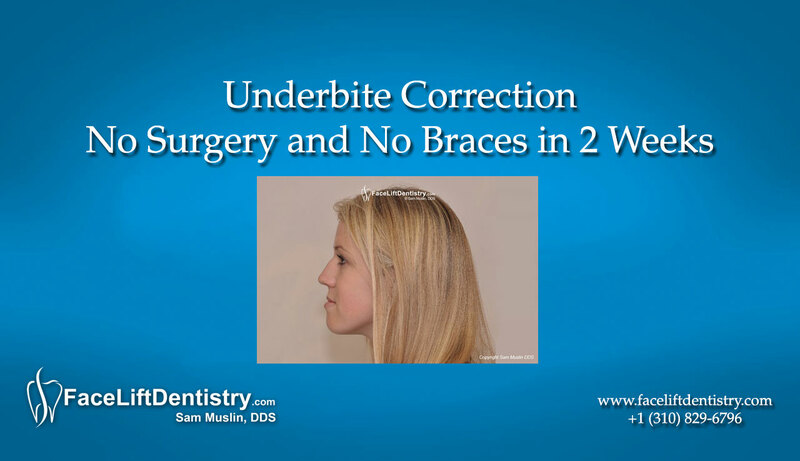 With jaw surgery and without braces the position of her lower jaw is physically improved while her bite is corrected. 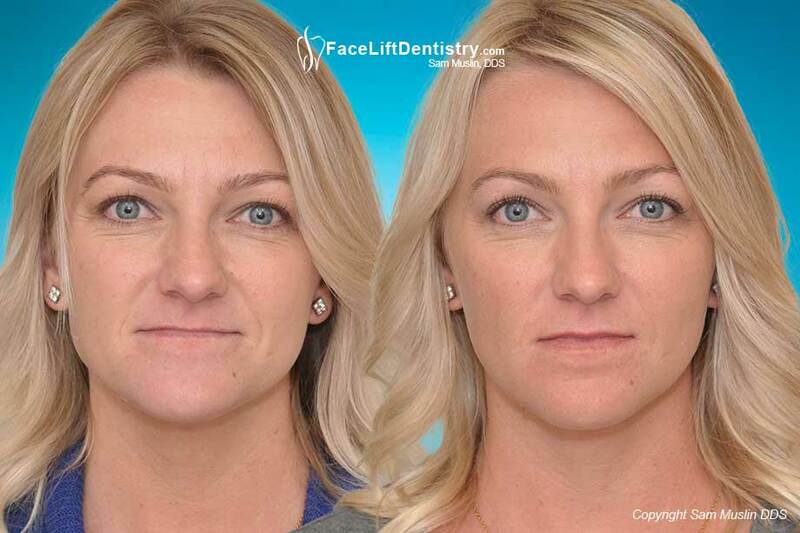 Her facial profile has improved dramatically as her lower lip and chin no longer sticks out. Her treatment took just two visits about two weeks apart from one another and she had no pain, no shots, and no discomfort. This best part is that by choosing VENLAY® restorations none of her natural teeth had to be ground down or compromised in any way. Most dentists would find this treatment hard to believe but the photos do not lie. None of the photos have been touched up, altered, or manipulated in any way so you know that you are seeing the true results. These improvements are simply undeniable and she was so excited that she gave Dr. Muslin permission to share her pictures and her story. At her first consultation it was hard for her to believe that this treatment was really possible. 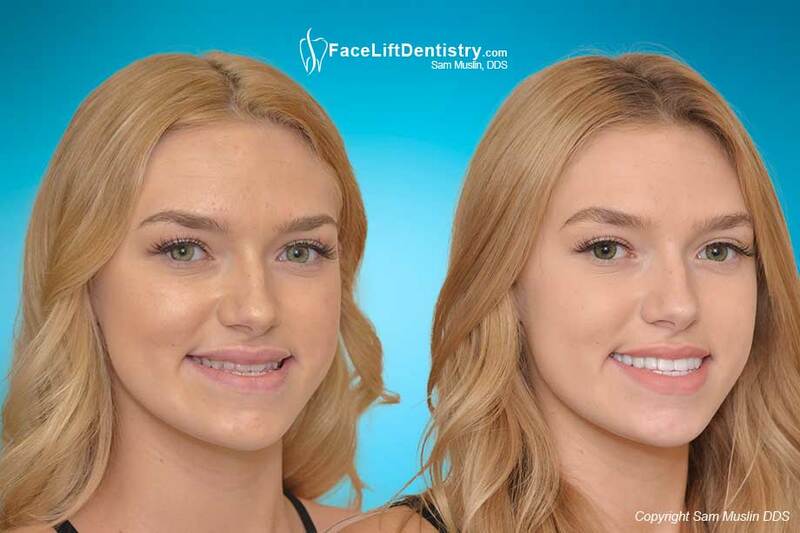 She traveled to Santa Monica, California with her Mother to meet Dr. Muslin after searching for a non-surgical underbite correction option. Despite the recommendations of other doctors to have surgery and braces she simply refused to put her body through such a traumatic and painful experience. 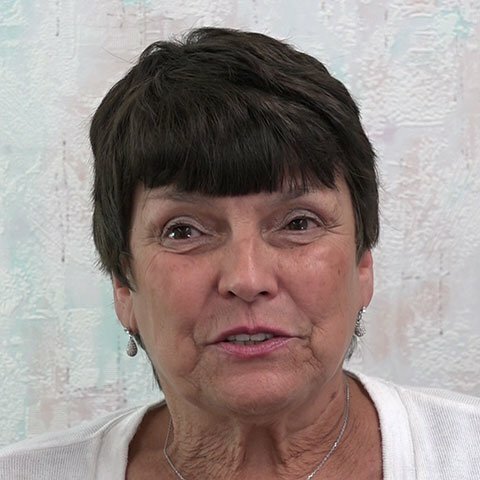 She quickly realized that Dr. Muslin was delivering these types of results consistently and predictably on a regular basis. They discussed the extensive technology and skills required by the dentists to actually achieve this type of bite correction; and while the treatment is quite complex behind the scenes it is fairly straightforward for her. Her Mother was shocked at how easy the treatment was for her daughter. Notice how the shape of her face has been improved. Her lower jaw no longer look so large and her jawline has a finer feminine appearance. Santa Monica, California dentist Dr. Sam Muslin invented VENLAY® bite correction as a way to correct all different types of bite problems. 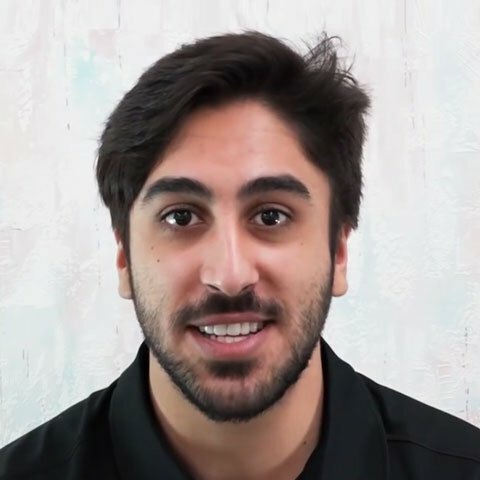 After treating patients with the traditional method of braces and successfully completing thousands of complex bite reconstructions and bite corrections, he brought all of this experience together to help dentistry take the next quantum leap. 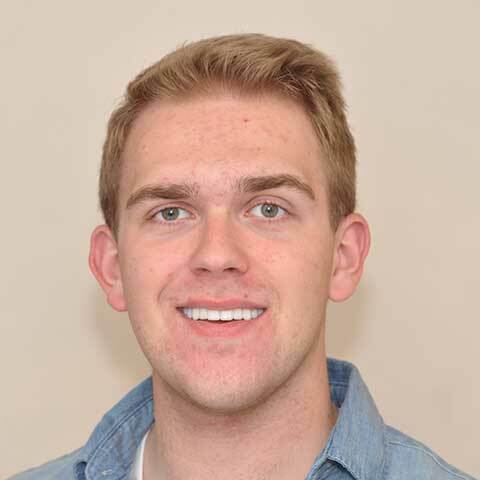 Merging together his knowledge from all areas of dentistry he says that he was able to “connect the dots and develop a solution that can correct your bite while idealizing your jaw position”. The introduction of this method makes it possible to take even the most complex bite conditions or patients that are in need of a full mouth reconstruction and complete their bite correction treatment without grinding down their natural teeth. The older methods of drilling down all your teeth to place crowns are simply obsolete with the new technology. By eliminating the need to grind down teeth, the many risks previously associated with crowns and full mouth reconstructions are gone. No grinding and no drilling also means no shots and no pain. 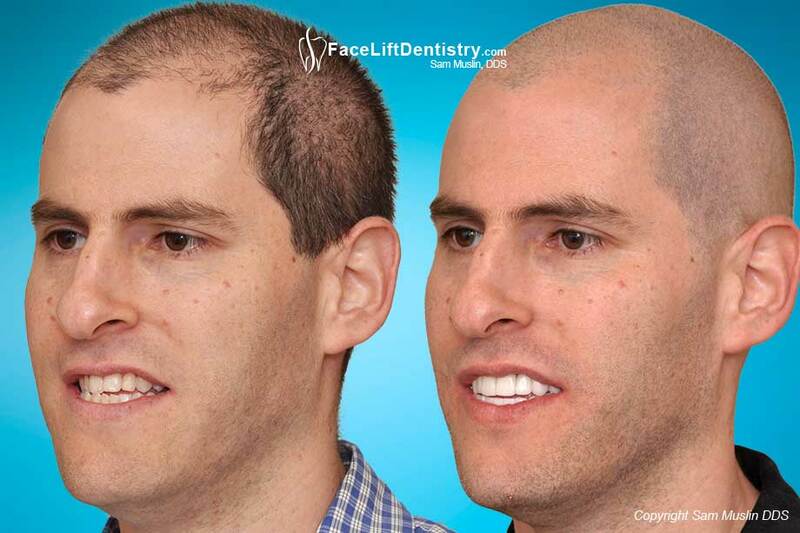 Finally the VENLAY® restorations are what allows for the dramatic anti-aging facial improvements and the profile re-proportioning which, until now has never been an expectation of a dental procedure. To learn more about Underbite Correction dentistry with VENLAY® restorations give our office a call at (310) 829-6796 to talk with one of Dr. Muslin’s treatment coordinators or to schedule your consultation today. 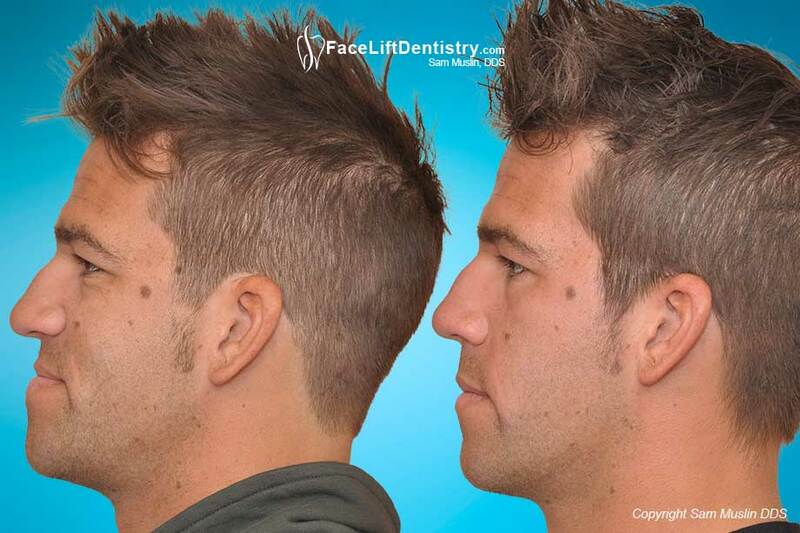 Underbite correction or non-surgical Class lll bite correction for headache relief, improved profile, clearer speech, and an incredible smile. No teeth were filed down, no surgery or braces needed. 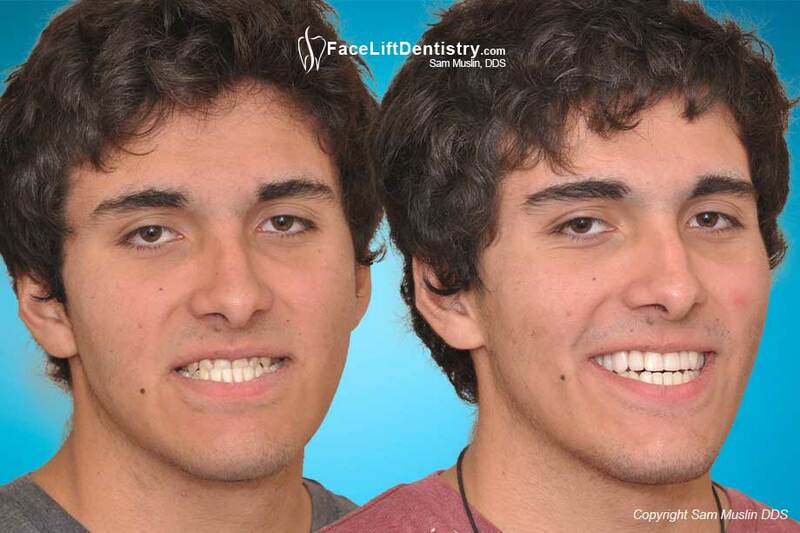 Once his class lll bite was corrected without jaw surgery or braces in just 2 weeks, his large looking lower jaw looks normal and his facial profile dramatically improved. Braces did not work. 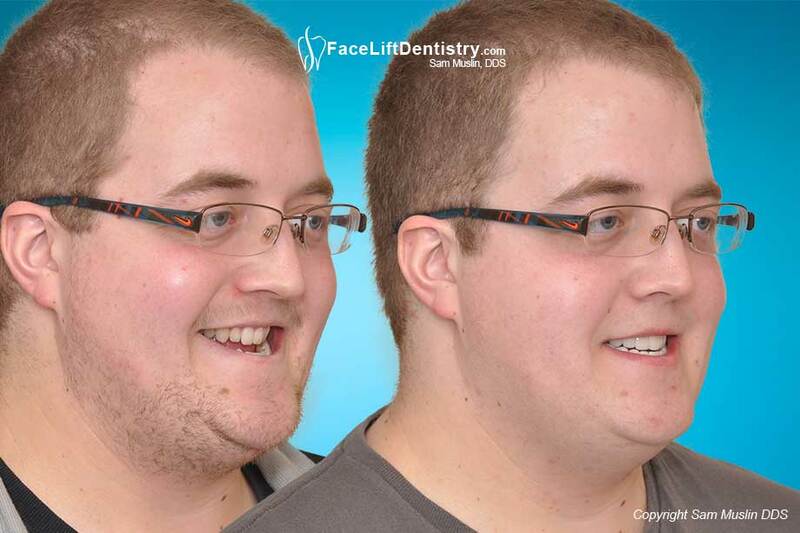 He was told jaw surgery was his only choice, and then he found the underbite fix without jaw surgery or braces. Underbite correction or Class lll bite correction that is non-surgical is a reality and has benefits that no other method can offer. Watch the Patient's video. 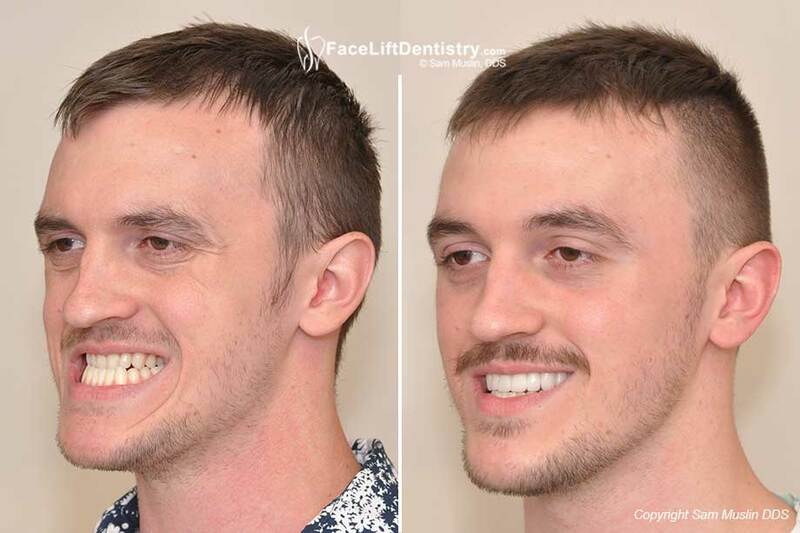 Underbite Correction for Adults in 2 Weeks"
His underbite was treated without surgery, braces, filing down healthy teeth with VENLAY® restorations and the Face Lift Dentistry® method in only two weeks. No downtime and minimal discomfort. Porcelain veneers can not do this!